This barbecued salmon and veggie entrée gets a touch of Asian flavour from our KRAFT Asian Sesame Dressing. 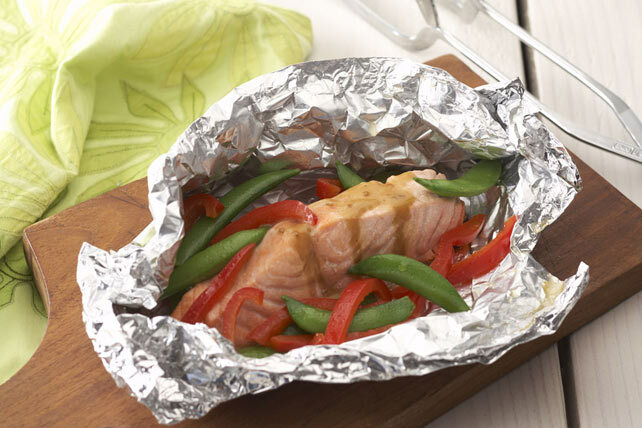 And, clean-up is a snap when you prepare dinner in single-serve foil packets! Cut fish into 4 pieces. Place 1 fish piece on centre of each of 4 large sheets heavy-duty foil sprayed with cooking spray. Spoon vegetables over fish. Bring up foil sides. Double fold top and ends to seal each packet, leaving room for heat circulation inside. Grill 8 to 10 min. or until fish flakes easily with fork and vegetables are crisp-tender. Cut slits in foil to release steam before opening packets. Drizzle 1 Tbsp. dressing over each serving. Heat oven to 350ºF. Assemble packets as directed. Place packets in single layer in 15x10x3/4-inch pan. Bake 20 min. or until fish flakes easily with fork. Fire up the grill and enjoy this flavourful main dish. As a bonus, the peppers provide an excellent source of vitamin C.